Over the last few years there seems to be a rise in pterodactyl sighting reports. 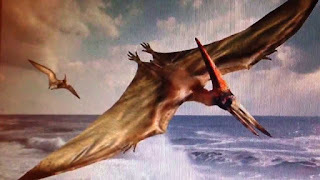 There are also some older, Civil War era, photographs that float around on the internet of what is perceived as a dead pterodactyl.Some of those old photographs are reportedly from some movie and are passed around as the real deal. Pterodactyl is the common word many people use to describe to two famous pterosaurs of the Mesozoic Era: Pteranodon and Pterodactylus. Most of us only know it as a a large flying animal that lived long ago when dinosaurs were alive. But with the recent sightings, it may make people wonder if some are still alive. While some sightings are harder to debunk, I think there is a good explanation for some of the sightings. In the picture to the left, you see what could be considered a modern day pterodactyl sighting photo. These sightings are coming from places within or close to cities. The witnesses are very adamant about what they saw and can describe what they saw perfectly. For the most part, I think the witnesses are being very honest and truthful about their sighting. But I think in many cases they are just fooled by what they are seeing. Yes, what they are seeing does look like the ancient, gothic bird known as a pterodactyl but there is another explanation. Many may not know about this, but these are Radio Control flying machines. Yes, the pterodactyl pictured above is actually a RC controlled pterodactyl. 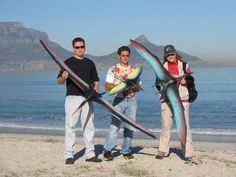 The picture on the right shows a group of guys with a few varieties of these remote controlled flying pterodactyls. I think this easily debunks the majority of pterodactyl sightings. But what about the witnesses? 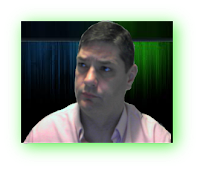 Well, as I stated I think many of them are being truthful in what they saw, but they just didn't realize what they were seeing. In the case of pterodactyl sighting in or near a city the person may see it from a distance and the sounds of the city mask the sound of the RC pterodactyl and they think they seen something unusual. They may even take a picture of it and boom you have a fresh pterodactyl sighting with a believable witness and a picture to back it all up. Here is a video of one of the RC in flight, notice and think about if someone took a picture of it in the sky...it could fool a lot of people. Also, this video is from 2006. 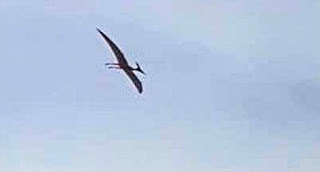 Now, I think these RC controlled pterodactyls can easily explain the majority of sightings and that maybe sometimes people are just mistaken. And other times maybe people are reporting sightings on purpose and pulling a hoax. There is probably a little bit of that going on as well. While most of these are probably explained away as a RE controlled device, there are some that may not be as easily explained away. Say for instant a sighting comes from a remote place, like the Congo or something. A sighting in the middle of no where. It would seem very unlikely that someone would be flying a RC controlled device in the middle of the Congo. In these cases, we would have to figure out if it was a missidentification. I would assume that there are probably some cases that are much more difficult to debunk or explain. Those are the ones that need more attention.